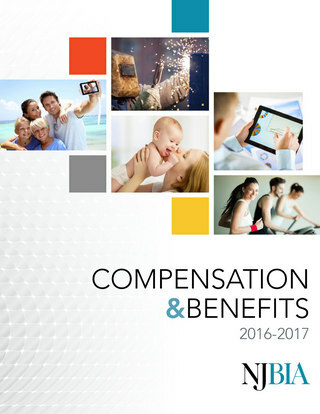 NJBIA’s Compensation & Benefits Report offers salary information on more than 200 job classifications from nearly a dozen major industries as compiled by the New Jersey Department of Labor and Workforce Development (DOLWD). It also includes benefits data on everything from family leave to retirement based on a survey of over 1,200 NJBIA member companies. It is our hope that the information contained in the report will help advance the competitive excellence and financial success of our members. To that end, readers are welcome to provide feedback on the report to Lisa Figatner at 609-858-9483. All comments, questions, or suggestions for information to be included in future reports are welcomed. NOTE: This publication is only available in digital format. You will receive a confirmation e-mail with a link to the virtual Compensation & Benefits Report. When you click on the link, you will be directed to a 6-page preview of the publication. When you come to the end of the preview, you will be asked for a username and password. Your username and password will be provided to you within the confirmation email. If you have any questions, please contact NJBIA’s Member Action Center at 1-800-499-4419, ext. 3.